Because of the unattractive shipping costs to Australia I have not used Amazon very much, though I remember that while in England, if I ordered before 4pm my purchases would arrive by post the following morning. (Not bad for online ordering in 1994). Needless to say, I purchased most of my books through Amazon because they were invariably cheaper and in stock, (at that time, very few companies could match Amazons service, price and availability). On Thursday 20th April, 2011, I purchased an Amazon Kindle 3 and it arrived on Monday afternoon, (a 4 day delivery), and while in transit, Amazon sent me an email to say that it has been pre-configured with my Amazon Account details so I could begin shopping. I expect to be able to read in full sunlight: this is possibly the main reason I purchased a Kindle. (I enjoy laying in the sunshine or against a warm rock, reading). I expect to be free of distractions: A Kindle may solve this problem of being easily distracted by the wonderful and useful technology and software on my Macbook, iPad or iPhone. I expect to be able to de-clutter: Although I love uncluttered environments, I find it awfully difficult to throw away books. Perhaps the Kindle will help me solve this problem. A Digital Curriculum: I can’t help wondering if the Kindle has a place in Education? I would like to know and understand if and how it could be used in the Education Space. To reduce the size of student bags and book packs. A clean, lightweight, compact electronic book reader, which looks and feels well designed. A screen, which is clear and very readable in direct sunshine. An Audio Book Player, which will play my Audible Book purchases. A synthesized “Text 2 Speech Reader”, which will read my books aloud. 4 Gigabytes of Storage, which is alleged to be sufficient to store 3500 Books and Portable Documents (PDF’s). An easy way to find and purchase books from Amazon. Amazon offer a selection of “cheaper books”, many eBooks are less than $9.99, although that price is beginning to creep up slowly, and of course the publisher is blamed for these increases. There is also a selection of free and inexpensive books. A seemingly dependable and lightweight device which fits in my pocket or handbag and which won’t lose charge suddenly. I expect to get 30 hours of continuous reading from my Kindle before needing to re-charge. I can re-download my Books and Audible Books, and synchronize content between my Amazon Kindle reader on MacBook, iPad, iPhone and Android Devices. I (and others) touched the screen before realizing it’s not a touch sensitive device. I don’t much like the way the screen goes black and then white again when I turn the pages, although I am getting quite used to it now. The Kindle is not as intuitive or easy to use as an iPad. It has a relatively steep “concept curve”, for an electronic book reader / player. I am uncertain how well the Kindle fits in with my objectives to implement a full functioning “Bring Your Own and/or Self Service Technology” within our school. An iPad for all Primary School teachers. A MacBook or iPad for all students and staff in Secondary School. A Digital Curriculum (the end of the awfully heavy school bag that students are forced to carry around with them all day). 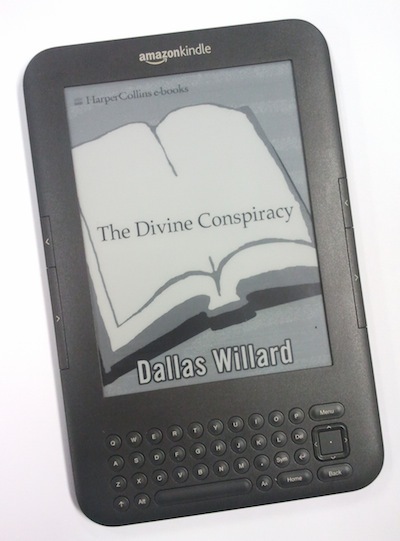 During the first few hours of ownership I spent an un-proportional amount of time viewing the Kindle page on the Amazon website, reading the manual and becoming familiar with my Kindle, more than I feel is necessary to begin using my Kindle productively. Jeff Beoz the Founder & CEO Amazon.com said, “Our top design objective was for Kindle to disappear in your hands – to get out of the way – so you can enjoy your reading”. As for me, the only time the Kindle has truly disappeared in my hands was when I tried reading in the dark. Over the past 7 days I have grown fond of my Kindle: I can easily purchase Electronic and Audible Books, I can easily access my previous Amazon and Audible purchases. I can read in the full sunshine. The Kindle travels well, and is especially useful when I wish to read without being distracted. My Kindle Wi-Fi remains a pleasing and very usable purchase. This entry was posted in Teaching and tagged Books, Kindle, Library. Bookmark the permalink.